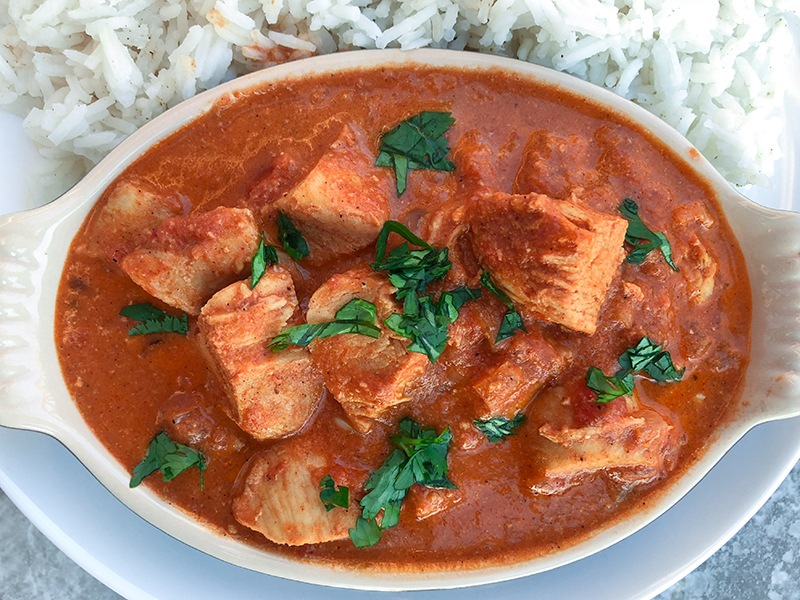 Chicken Tikka Masala is made with flavorful chunks of chicken in a spiced, creamy tomato sauce. It’s perfect to serve with basmati rice, it’s gluten free by nature, and it is super easy to make at home. When you go gluten free, you quickly realize that one of the first things that needs to go is all of your favorite takeout. If you’re like me, and you used to subsist almost entirely on restaurant food, this is a big blow. 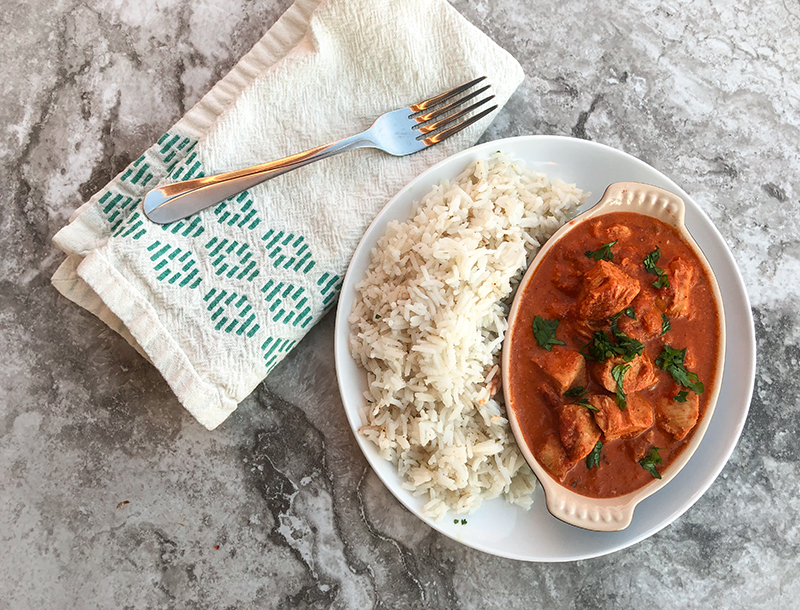 Indian is one of the foods that just depends on the restaurant if it’s safe (some use flour to thicken, or meats are contaminated by naan in the tandoor), and a lot of people have never made it at home and so it can be really intimidating. But the good news is that most Indian recipes are gluten free by nature, so you can get restaurant-quality food without making a bunch of substitutions. That’s where this recipe comes in; it tastes like restaurant food, and it’s not something you have to slave over all day to get that authentic taste. I obviously don’t have a tandoor in my kitchen, and I doubt you do either (although if you’re a fan of Good Eats, Alton Brown will show you how to make one out of a flower pot! ), so I make the “tandoori” chicken in the oven and then char it with the broiler. This recipe is not bright red like what you’re probably used to seeing in Indian restaurants because that red color comes from Red Dye #40. Not that I’m against food coloring as a rule, but I don’t need my chicken to be dyed. It can be slightly challenging to find a gluten free garam masala blend, but they’re out there. I used Simply Balanced brand. If you can’t find that or another suitable one, you can make your own blend! There are several out there on the web, but I choose to buy one pre-mixed because I don’t use some of those spice often enough to buy big jars. Not gluten free? Then serve this with naan! Trader Joe’s has some great options in their frozen section. That’s the only change you’d need to make. Place chicken on a rimmed baking sheet lined with foil and rub cumin, coriander, and cayenne pepper on both sides. In a separate book, mix together yogurt, ginger, and garlic and then cover the chicken breasts on both sides with yogurt mixture. Let chicken bake for 30 minutes, or until an instant read thermometer shows an internal temperature of 165 degrees F.
While the chicken is baking, melt butter in a dutch oven or heavy bottomed pot over medium heat. Once butter is melted and bubbling, add onions and sauté until just barely starting to brown. Then add jalapeños, garlic, and ginger and sauté for about a minute, or until fragrant. Next add the cumin, coriander, and garam masala to the aromatics and allow to cook for several minutes, stirring constantly to open up the flavors of the spices, until very fragrant, but not burning/browning at all. Add crushed tomatoes and sugar, and turn heat to medium-low. Let simmer for about 20 minutes, stirring occasionally. Garnish with chopped cilantro, if desired and serve with basmati rice. 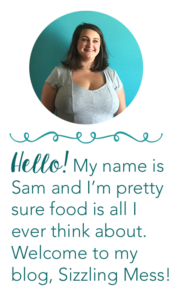 Sam, thank you so much for sharing! I love Indian food and this looks so easy to make. Since I follow a ketogenic diet rice is out for me (too many carbs) but I bet your dish would be amazing with cauliflower rice! Definitely! I bet it would be good with cloud bread as a naan replacement too. For keto, I would probably add some extra cream to make up for the missing sugar as well and I’m sure it would be delicious! Plus full fat yogurt if you can find it ;). Definitely miss samosas! And naan. This is SO bright and beautiful! I’m totally trying this with pressed tofu! Mmmmm… all those lovely spices! This looks delish! 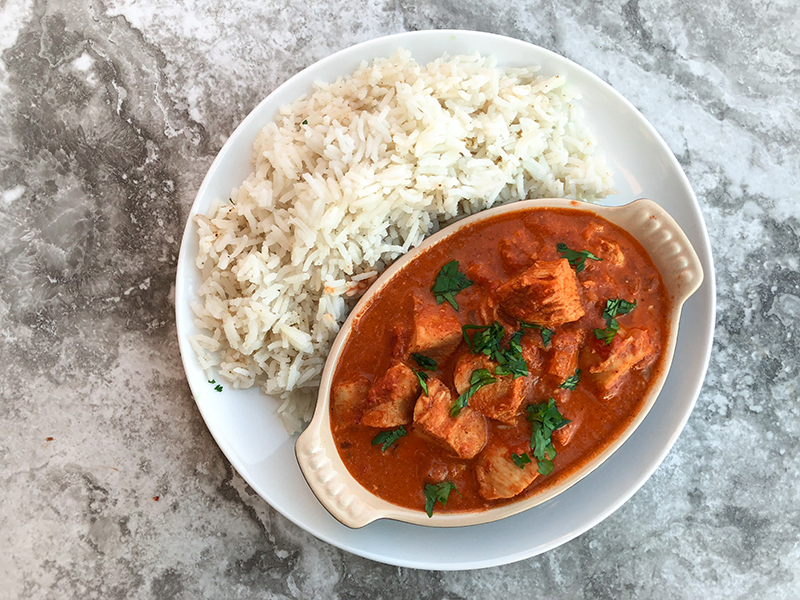 I love Chicken Tikka Masala! Though I have never made it myself! I need to change this! I have been wanting to try this dish for some time now, but just never have. Your recipe sounds easy to follow and looks delicious! I’m not sure how I never realized that the pink chicken was because of red dye – it seems so obvious now! I’m with you on not needing to add extra dye to the recipe. This sounds delicious! it looks delicious, but I don’t want to have meat, I really want to try to make this with tofu instead of chicken! I’m sure it would be good with tofu! Or roasted veggies. I can just imagine the aroma as this cooks. Great comfort food….and all that sauce on the rice would be so good!! This dish looks just simple and delicious! Pinning to add to my menu later this week. I love Indian food! I love that this recipe is gluten free. That sauce sounds incredible. Maybe I can use tofu instead of chicken? Can’t wait to play around with this one. I’m sure you can! Or roasted veggies :). Omg this looks absolutely DELICIOUS!! I haven’t had tikka masala in way too long! Can’t wait to try this recipe! Wow! This looks delicious! 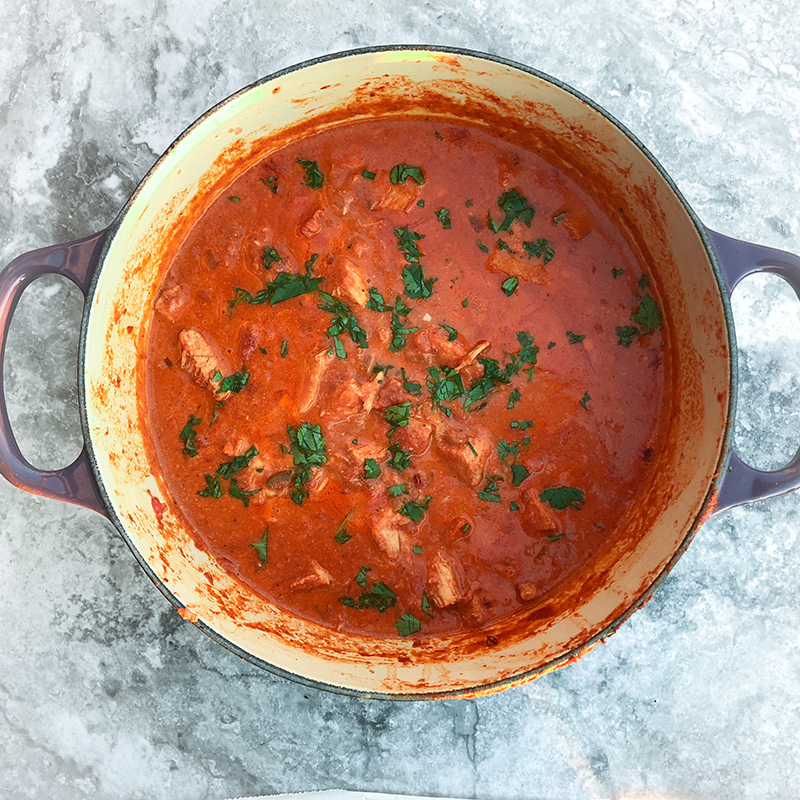 I am obsessed with Chicken Tikka Masala. I’ll have to go hit up our local Indian grocery store to buy some good garam masala, so I can make this. Thanks for the recipe! The sauce looks beautiful! I would love to scoop up the chicken and sauce in some homemade naan. That sounds like a perfect dinner to me! I love good eats!!! and I also love the flavors in Tika Massala. It’s so delish. I’ve never tried to make it at home. I should give it a try! Haha, I know what you mean! Replicating restaurant food can be a challenge. This recipe does taste like it came from a restaurant, without a tandoor and only a little ghee ;). There are two local Indian restaurants here who’s Tikka Masala is basically identical to this one! I haven’t cracked the code of the tikka masala at my favorite Indian place, though…. yet…. This looks so yummy and easy! I have to ask – where did you get that background? It’s gorgeous! It’s a peel and stick tile from Home Depot! :). Looks delicious! I used to order this all the time! 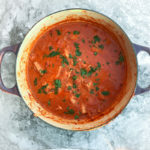 I love chicken tikka masala! Perfect comfort food choice for this cold weather! When I had to go gluten free, it was really difficult to give up the convenience of take-out for me too! This dish looks amazing! I have difficulty with heavy cream…do you think I could use full fat coconut milk instead for this recipe? Definitely! It would obviously taste like coconut, but I think that would taste great with this dish! This recipe was easy to follow and super fun to make. I was (admittedly) a little intimidated at first but halfway through I was feeling pretty dang awesome. Great fresh and amazing as leftovers, my boyfriend even made a point to text me mid-day to tell me how delicious it was. Definitely adding into my rotation of meals! I halved this recipe, because I was only cooking for the boyfriend, as I, admittedly, am not a fan of Indian dishes. I regret that decision to the fullest now! The recipe was easy to do, and understand, almost full proof I gotta say! The bad part: When we sat down to dinner I tried a small nibble of it, and I fell IN LOVE, I was so upset I didn’t make enough for myself! If you don’t think you are a fan of Indian cuisine, give this one a try, you will NOT regret it!